I've been piddling with scratch built quad copters and tri copters for several years now... the off the shelf versions have come down in price so much and up in sophistication that I broke down and got one. Looking at this pic it reminds of one of the war bots in Star Wars... the three axis gimbal mount looks like a gun turret. It transmits HD video back to the controller via a 5.8 G wifi connection... you can also see the video real time on your smart phone. it records 1920 x 1080 mp4 video on a micro SD card that plugs into the camera. 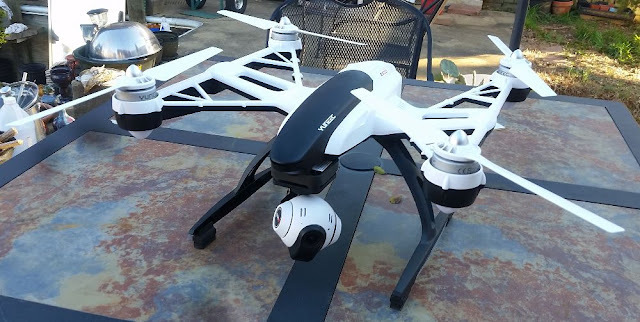 It has GPS in both the copter and the controller so it can do some quite amazing things like follow me... look at me... as well as a more normal flying mode with GPS position hold.... here's a little video I shot nearby at USC Upstate.